Breakfast (sausage Egg McMuffin) at Charlton Plaza, Masspike. Travelers in limbo -- ages from babies through 80s and maybe older. What are their stories and what do they have in common? Flags on the wall, and signs that say "God Bless America." These days flags and "patriotic" signs are like placards and bumper stickers left long after the election. "God (if you're out there), please help America" -- that I'd notice. How can anyone make worthwhile generalizations about anything? Say that someone's "an American" and what have you said about them? Not much. Another reason I'd have made a mediocre journalist: I keep asking questions about the things that need to be "given" if you're going to actually write the story. If you have to look up every word, you won't get very far, and every field has its assumptions and ground rules that are almost as basic as the meaning of words. How can anyone make worthwhile generalizations about anything -- generalizations that actually tell you something worth knowing, generalizations that do more than just give you the illusion that you know something? But how can we communicate without generalizing? Starting from scratch every time takes forever. Generalizations are a kind of shorthand. Or building blocks. Hostile, or at least mutually suspicious, parties have a hard time negotiating because they agree on so few generalizations -- they have to establish them from scratch, one word at a time. I can be diplomatic, at least in writing and in short spurts, but I would have made a lousy diplomat. My maternal grandfather was a diplomat, and by most accounts (starting with my mother's) a lousy one. What success he had in the Consular Service is generally attributed to my grandmother. He had a Harvard degree, she had a high school diploma, but she was the one who became fluent in French and Spanish so she could communicate with more people. I'm not fluent in anything but English, but I'm superfluent (superfluous?) in that. I can puzzle my way through written Spanish and French, and I know the Arabic alphabet well enough to check transliterations. 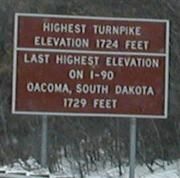 Sign announcing that this is the highest point on I-90 till Oacoma, South Dakota, elevation 1,724 feet. I remember that sign from all those trips to Ithaca, and Albacon, and the trip that led to Allie. Except I remembered the number wrong -- memory said it was 1,742 feet and wasn't sure whether that was here or in South Dakota. My reading comprehension and/or retention at 65 mph isn't all that great. I just Googled on +Oacoma +elevation and found, third on the hit list, the above photo. The site owner collects photos of road signs. Not only does he have this sign (from a 2001 trip), he also has a sign from Oacoma, taken in 1999. He reports that the highest elevation in Oacoma is actually less than 1,729 feet -- more like 1,726 -- so it's not just my memory that's screwed up. Truck pulling away from the tollbooth at the beginning of the New York State Thruway, for Payne Company. "No Payne, No Gain" was the slogan. Mary Payne would have liked it. I've already forgotten what business Payne Company is in. See what I told you about reading comprehension?